Do you remember the movie “Groundhog Day”? Bill Murray had to keep doing his day over again and that inspired me to write this post today. If I had a quilting do over, what would I do? It was easy to pick a quilt because I am currently doing it over. 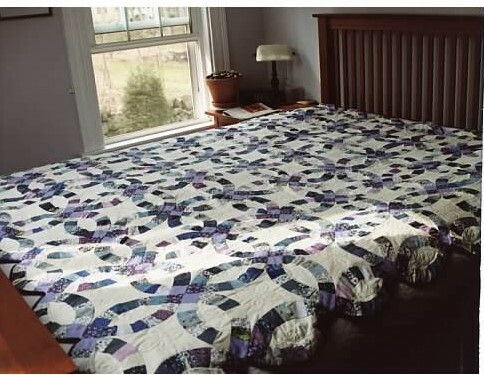 Aside from the obvious that I would seriously reconsider making a wedding ring quilt because I really didn’t have the skills for it, even though this was my second one, the first thing that I would do differently with this quilt would be to make it bigger. It just barely covers the top of the bed. Since it’s never going to be on the bed but probably just thrown over the back of a chair, that’s not a deal-breaker. What I am currently doing over is adding more quilting. I hand quilted this (hence the two years to complete) and I quilted love knots and ivy leaves inside the rings. I am now going back over it and outlining the rings themselves with quilting stitches. My ability to take a good quilt photo has also improved so I’ll take another shot once the quilting is done. If you had a quilting do over, what would you do?